Magica Goldens: Setting a schedule - and then breaking it! One of the things I'm stressing in my puppy class right now is routine and schedule. Puppies need schedules! Day one here I start to get puppies (and boarders when they're here too) into a routine. There will eventually be some flexibility in their schedules but the tighter I can keep to the schedule initially, the easier life with puppy will be on all of us. The other 'big' thing I'm pushing with my puppy class is how much freedom they're giving their puppies who haven't earned that much freedom yet. Our society has moved from one extreme to another with both child-rearing and puppy-rearing. No longer are puppies confined to the laundry room during the housebreaking stage - or relegated to the backyard with the BBQ grill. I see more and more puppies that are infantilized, treated as furry children - given an inch they trot off with a mile. Love your dogs and puppies - but give them structure and set criteria so that they can meet your expectations. One of the things I want to share with my puppy people is what a day in the life of Kipling is really like right now. It's easy to forget what it's like to live with a puppy! One thing to keep in mind is that when I talk about 'training' it's a pretty loosely defined concept for me - everything you do with your puppy is training. Puppies are sponges! Consistency now pays off big-time later. One of the reasons I use the phrase training/play in the schedule below - any training session right now is super short - five minutes tops and is really very informal. Training and play might be any number of behaviors including tug/give/tug, sit, down, stand, recalls, walk on a leash, down, wait/stay, retrieve sessions or tricks like spin and touch. 6:00am: Breakfast - Patience while breakfast is made and the BIG boys are fed. 6:30am: Into expen with toys - expectation of quiet solo time, play while the rest of the house gets going for the day. 7:45am: In his crate for a nap/settle. 12:45pm: Solo potty, play/train session. 5:15pm: Dinner *** - patience while dinner is getting made. 6:00pm: Pack play, swim, group training session, etc. 6:30pm: Settled/solo time in the expen. 7:30pm: Outside for another potty and play/train session. 8:00pm: On-leash indoors settled time with the boys, chewies, don't chase the cat, don't climb into the dishwasher, etc. 9:30pm: Out for potty, bedtime! There's quite a bit of flexibility in his schedule, impromptu trips to the garden center to get some pepper plants, off to the farmers' market for goat cheese, solo car rides, group outings to the agility field (and random cookies for hanging out while the bog boys work), etc. I do try to get Kipling out solo as much as possible - to experience new things without the assistance or comfort of the big dogs - I'm always concerned with dogs and puppies bonding first to their people and second to their packs. I lived with littermates years ago and experienced the folly that goes with letting dogs pack-up to each other first and foremost - never again...Perhaps more on this in another post (the net point here is that no reputable breeder ever sells two puppies or young dogs - even non-littermates - to one family because it's always a bad idea). So, here's where things get interesting. The nature of trailing, going to dog shows and living in a busy world in a busy household is that things don't always go as planned. I work really hard the first week that a puppy is home (or first few days for a boarder) to keep the schedule, working through the dog or puppy's frustration of restriction - then in small ways I start breaking small parts of the schedule. I'll get him up significantly earlier (or later) than normal one day. The next day dinner might not come until 6:30pm - or will come as dinner lite and then dinner comes at 9pm. Kipling just had a very successful roadtrip to NH for the weekend, he stayed in a hotel, he did his business when asked, he ate well, he slept well - in large part because I've built in that schedule - and can adapt that schedule on the road. Lunch is going to come sometime between 11:30 and 1:30pm, naptime is built into the day so if I need to crate him for an extra naptime - it's no big deal as long as the other pieces (training, play, potty) all happen. ** One other note - even though my yard is fenced and the big boys are great with the puppy - more than half of Kipling's treks outside to potty (solo and with the pack) are done so on leash. 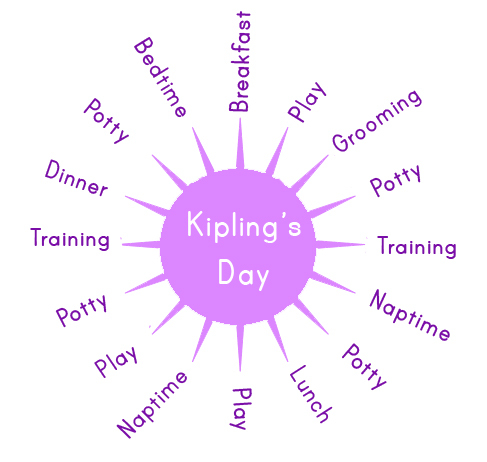 This accomplishes several things: First, it makes training happen, Kipling is getting several leash training sessions a day - very informal, but very consistent - the leash becomes tight we stop until it's not tight anymore. Second it means that he doesn't think anything of going potty on leash - you'd be surprised how many adult dogs can't or won't GO on leash. It's a behavior that's really easy to overlook until you get to a trial site and your dog won't GO before their run (or before bed at a hotel, etc). *** Some nights all three boys are served 'dinner lite' - in keeping with their routine, but we're off to do something fun (a hike, a run at the school, we're going to run or train agility, etc) and I don't want them to run or swim with a full belly. They'll swim, run, cool-off, etc and I'll feed them the remainder of their rations later in the evening.